The Gospel of John tells the story of the life, death and resurrection of Jesus Christ. 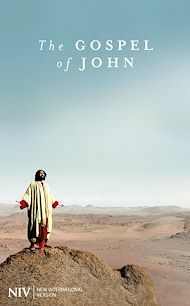 This edition is published to accompany the cinematic presentation of the Gospel - a feature length film to be shown on BBC television and Netflix in 2015. The film - part of the Lumo Project - has been informed by leading world experts' latest theological, historical and archaeological research on every aspect of life in first century Palestine. It was shot on location in Morocco, using the very latest 35mm digital film cameras to ensure picture quality of the very highest standard across a number of platforms - cinema, broadcast, BluRay, DVD and the web. The voice-over script is taken from the NIV Bible but the film has been shot with the intention of overlaying the Bible text in any language. This multi-language Biblical resource is set to transform the way in which people engage, discover and study the life of Jesus through the Gospels. Mark, Luke and Matthew are currently in production.